There are totally going to be titans in our Apocalypse game it will be awesome. Can’t wait to take some photos. Er… and play the game. I haven’t been my usual blogging self lately. No opinionated blow-hardiness(?) around here – I’ve actually been doing proper painting. Astonishing, I know. I’ve been preparing for our up-coming apocalypse game, and I have to say, painting GW-sized units of infantry is wearing pretty thin. I’m starting to think after all these years that hey, maybe I have enough Imperial Guardsmen and Battle Sisters for my purposes. I mean I have more than enough for even the largest casual games, and the variety available to me pretty much covers all the units I actually find interesting. With my time and money being drastically restricted now by an extra family member, a reduced income, and an increasingly demanding workload, I think it’s time to put the brakes on and stop actively collecting. I might pick up the odd vehicle, but to be honest I only want another hell-hound, maybe another russ variant. Stop collecting 40k that is. I’m thoroughly enjoying painting my half-a-dozen Yu Jung soldiers for Infinity. It’s a real struggle to force myself to paint twelve nearly identical battle sisters to match my other nearly identical battle sisters when in front of me are sitting a ninja with a sniper rifle and four soldiers who, while admittedly all in the same uniform, vary hugely in pose, face, hairstyle and even gender. Once they’re done and added to my domaru and keisotsu I’ll have a legal 150 point army, which is enough for small games. Contrast that with the twelve battle sisters I have to paint to get oh, about a quarter of the points value of the smallest 40k game anyone would ever agree to play, and you can see why I’m kind of over it. Don’t get me wrong, 40k is a fun game, I’ve always said so, and it’s not like I’m getting rid of my armies or anything foolish like that. I just think enough is enough, at least in terms of infantry squads. Multitudinous, mind-numbing infantry squads. Stay tuned, and I’ll put up pics of my finished Sisters and Yu Jing soon. So, I finally got my hands on the second part of the Sisters of Battle White Dwarf codex. I’ve been holding back from joining in the online discussion until I saw the points values and have all the info, and I have to say, I like it. At last, battle eight of the Invasion of St. Arkham – a 2750 point game. I had trouble getting my list together this time because I ran out of models and points at 2,680 to make up a legal Force Organization Chart. We thought of a few possibilities: allow me an Apocalypse stratagem, maybe use my new Rangers as sneaky xenos with their own agenda, but eventually we agreed I could just take an extra Elite slot. After all, the invasion is almost accomplished, so the Arkhamites would be bringing out their last ditch guns. I filled the slot with a small squad of psykers. “My lord Inquisitor, I’m glad you could join us.” Lord General Drake bent his knee and bowed his head before the metal giant. It was for the benefit of the men – he and Borgez had already met last night, when the famous Ordo Hereticus agent had told him that the Ultramarines were refusing even to acknowledge his Inquisitorial rosette. It was a bad sign. It meant either that the marines had decided Borgez himself was tainted, or that he was incompetent and had failed to notice heresy on his own doorstep. The mighty cyborg swayed and creaked as the ground shook, drop pods raining down. Borgez’s face remained stony in the huge metal body, his beady eyes sharp and black. Drake made the sign of the Aquila and touched his icon of the Emperor to his mask in silent prayer as Kreig Death Riders cantered past him. Where were the bloody tanks? The campaign’s getting down to the wire now. I made a mistake last time – the mission we played was Implacable Advance not Trench Warfare. This time it was Trench Warfare, and it was a doozy. As always, you can check out the campaign we’re playing here at Sign of the Aquila. 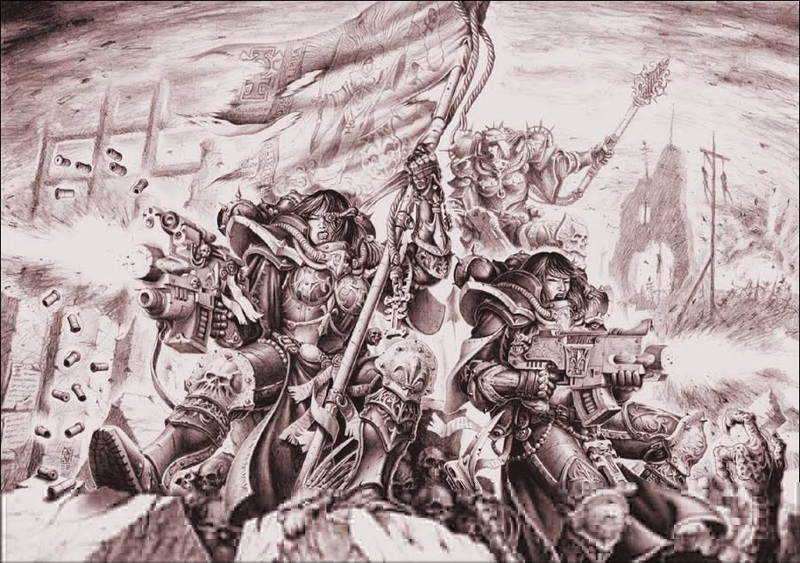 So this is probably old news to most of you, but GW has announced that there will be a Sisters of Battle mini-codex printed across two up-coming issues of White Dwarf. Since the Witch Hunters are one of my 40k armies, I have some thoughts on this. Lord General Drake peered out over the trench lines. His army had managed to fight the invading Astartes to a standstill here, at great cost to the once-thriving city, and battle had been raging for over a week now. His men were dug in deep, and the Ultramarines were proving difficult to track. They performed hit and run attacks on his embattled troops seemingly at random. But now the sky was filled with the dark shape of an astartes battle-barge, and the enemy had collected in enough numbers to be clearly visible to long-range auspex and psyker-augury. 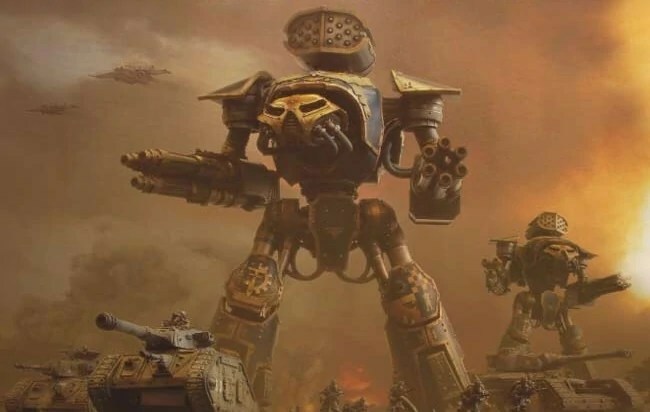 Drake’s ancient power armour, gifted to the founder of his line by the Mechanicus long ago, made him the equal of any astartes in combat. The huge plates hissed and clanked, and gouts of smoke and steam belched from the valves on his back. His boots crushed the gravel to powder and he grimly primed his hefty plasma pistol and checked his sabre, reinforced for his augmented strength. These traitors would regret coming here, to his world, sullying the sacred ground with their heathen filth. He looked over and nodded to Paxila. The canoness soared into the air, trailing flame, her white armour gleaming in the gloom. She landed on top of a Sororitas vehicle with an audible clank and raised her flaming power sword. The men bellowed and cheered at this angelic display. Witch Hunters: what does the future hold? As a part-time Inquisition player I’ve been pretty excited about the release of the new Grey Knights codex. 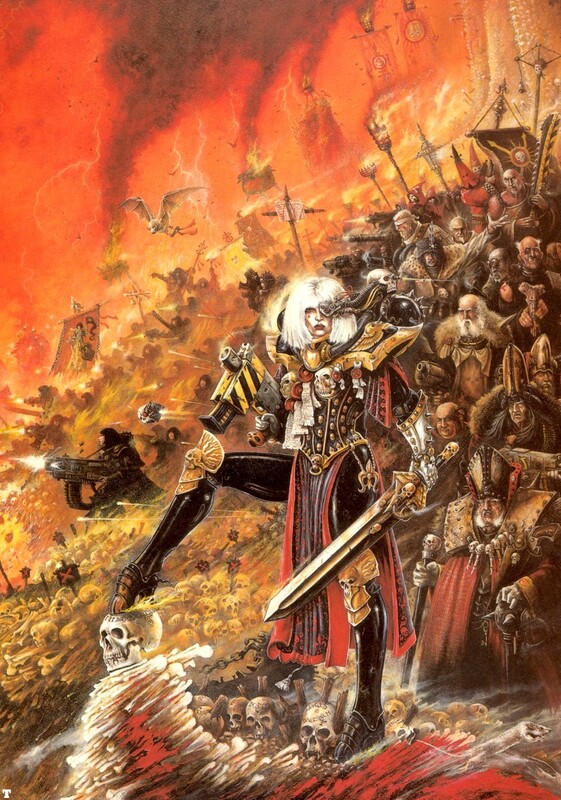 This was mainly because I was keen to see what Games Workshop might have planned for my beloved Ordo Hereticus.